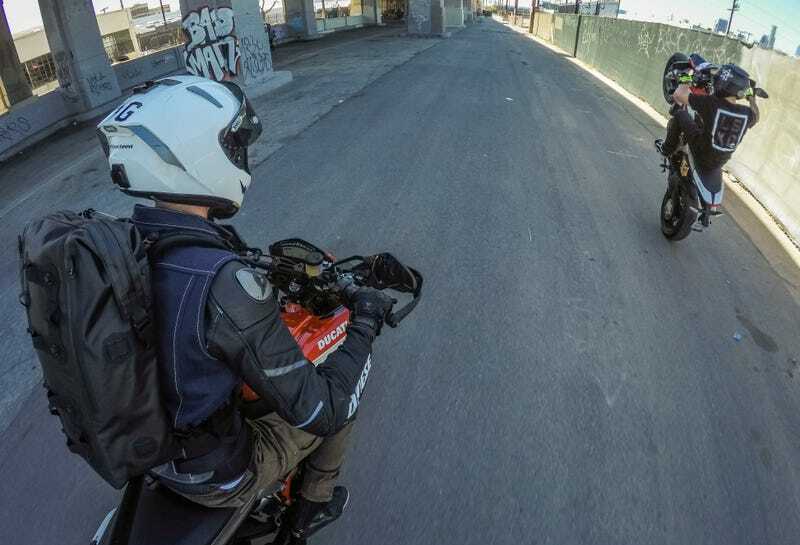 What Do You Want To Know About The 2016 Ducati Hypermotard 939? I spent several days this week on the press launch for the new 2016 Ducati Hypermotard 939 and Hypermotard 939 SP. Photos are being edited and the review is on the way, so get your questions in now. This launch was unlike most. Instead of bringing a bunch of journalist types to some hotel and planning a route to lead us on and photo stops to ride past, Ducati put us all in a house and teamed up with GoPro’s in-house camera crew to turn us loose in the city. Even better, they mixed in some pro riders and other folks from different areas to give the trip more of a “riding with buddies” atmosphere and to bring the hooligan levels to an all-time high. The result was thousands of wheelies, lots of tires destroyed, and some absolutely insane shots of a whole bunch of dudes getting their motard on all over the city most of us live in/near. This is going to be a fun one to share, and I have to thank the GoPro and police/security teams who helped us pull this off. Any and all inquiries are welcome, and I promise to read as many as possible until I get annoyed or bored by people asking how it’s different from last year’s model or how it compares to the Husqvarna 701. Because I’ll get to that.